Killer Bs hit the course. We are wrapping up coverage of the 2009 Charm City Cyclocross with the traditional ‘In The Crosshairs’ podium finisher interviews. You’ve heard what the pros had to say, now let’s hear how your fellow competitors saw the day. Thanks for reading. Michael Yozell (VisitPA.com, First place, Men Masters Elite):C3 built a great course. I’d have to say there isn’t one particular section that was a favorite but I did think the stairs in the outer field was a nice touch, very creative and much better than the old barrier placement. The course had good flow throughout. Adam Driscoll (Adventures For the Cure, First place, Men’s 2/3/4): My favorite part of the course was definitely the natural barrier where you have to do a 180 turn around a big tree. This was a great place where we had lots of spectators. Robert Sheffield (Squadra Coppi/IM SAAB, First place Men’s 4): The two sets of single track around the trees on the far side of the course separated by the stairs. It was fast and really smooth. Jonathan Seibold (Family Bike Shop/DCMTB, Second Place Masters Men 3/4): The stairs and the new swoopy section right after them. I also like the planter box around the tree. Chris Mayhew (JBV Coaching, Third place, Men’s 2/3/4): The planter box. I’m a big fan of natural obstacles. It feels a bit old school since they’re really high. And it’s such a natural focus point of the course with the pit and BBQ right there. It’s always the loudest part of the course. Lindsey Hillesheim (Squadra Coppi, Third place Women’s 3/4): All of it. Charm City has great flow with turns that are wide enough that you don’t to brake much and enough obstacles to keep it interesting and technical. Jay Morali (C3, Third Place Masters Men 3/4): I really liked the stairs on the back side. A nice addition to the course this year. Jesse Leifert (Route 1 Velo/Arrow Bicycle, Third Place Men’s 4): I actually really enjoyed the whole first lap. Having never done a cross race before, the experience of riding on wet grass and dirt around trees with 125 of my fellow cyclists was a pretty cool experience. Also, having staged towards the latter third of the pack you could really see everyone getting freaked out by the proximity of everyone. I ended up following Tim Brown from Bike Rack and we passed a bunch of people for the first two laps as we tried to make our way back to the front. It was a blast. Driscoll flying back to the front of the field. Adam Driscoll: Well I almost lost the race on first lap since I dropped my chain. I went from 1st to about 25th place as I was having a tough time getting it back on. My teammate Patrick Blair passed me and said “man Adam you were in first”. Once I got the chain back on I immediately started to make up ground as I did not want anyone to get away. So caught back up pretty quickly with top group and decided to wait another half lap to go again. Then I made my decisive move at the natural barrier around the tree and never looked back and was able to hold my big lead. Chris Mayhew: There were a few. Adam dropped his chain the first time up the starriers so we punched it. He came back a lap later twice as fast as he was the first time and that was game over for the win. I did an incredibly stupid thing and tried to ride the sand the last lap rather than run and got stopped. I got lucky that one guy in front of me dropped a chain on the starriers on the last lap. Jonathan Seibold: We had a group of five together when Steve Robinson and Keith Rohr attacked. None of us could go with them and our group shattered. Unfortunately for Keith he rolled a tubular. Once again there was a group of five and we were chasing Steve. I was able to make a move through the sand on the last lap and get a gap on the group and hold it to the line for second. My best cross result ever. Jay Morali: I was on the second row for the start but had trouble getting clipped in so quickly found myself around 30 positions back as we entered the course. It took some time, and alot of effort, to get back to a good position. I finally found myself near the front of the race fighting it out with Jonathan Siebold, Keith Rohr, and Pete Jensen. I think we all had our moments where we made the slight mistake rounding a corner too wide or coming into one too fast and we would trade positions. I actually hit the deck twice on the day which cost me valuable time. We all spent time trying to catch Stephen Robinson, the eventual winner from the Squadra Coppi Team. Jonathan put in a hard effort to get a gap on me and I could not get back on his wheel but was able to hold off the others to secure a 3rd Place finish. Jesse Leifert: That would have to be getting out sprinted at the line and losing second place. I wish I could come up with some excuses about why I wasn’t able to hold off Tim for second, but he was flat out faster than I was coming up to the line. I really didn’t realize how close he must have been coming out of the last turn leading onto the pavement. Regardless, had I known he was there, I don’t think there was much I could have done about it. Robert Sheffield: I came onto the course 5th wheel, which was right where I wanted to be. I had to fight a bit on the pavement to get up there but I knew I would do a good race once I came in with the leaders. Lindsey Hillesheim: I was in the lead going into the 2nd lap and the leader passed me on the short dirt hill before the first pit entrance. She had blown by me the day before, so I wasn’t optimistic that I could hold her wheel for long…and I didn’t. My teammate and I worked together on the last three laps to establish a good gap on the rest of the field. On the final lap, she attacked at the stairs and since I had been doing most of the pulling I wasn’t able to match her acceleration. And that’s how I went from 1st to 3rd. Michael Yozell: There are two moments that stick out. The first was when Dave Weaver punctured. That really changed the dynamic of the lead group. The second was the huge attack Dave Fuentes put in on the pavement just as we got the bell. His move shook up the tempo and allowed me and him to put a gap on Ralf and Blair. Hillesheim and Woodrow chasing the leader. Lindsey Hillesheim: Last year the Cat 3/4 women’s race went off at 9am with the Cat 4 men, so I am still dialing in my pre-race routine for the new 11am start time. I ate breakfast around 6:30am, had a little something at 9:30am and drink mix from there on. I ate more at Nittany Lion the day before, but felt really sick during that race; no problems at this one. I was on the course by 8:15am and got in 3-4 laps and then one more between the 9am and 10am races. During the 10am race, I did two starts from the grid down the prologue. It worked well–I felt warmed-up and confident about the course. Jay Morali: Pre-race meal…well that has obviously been a fun topic of conversation here on cxhairs.com. Last year I started out with PB&J before moving over to French Toast but after reading all the responses from podium finishers I decided to go with the popular choice of oatmeal. I did follow Katie Compton’s advice and added some peanut butter…it seemed to work out well. Adam Driscoll: Well this race was very interesting since JDRF (juvenile Diabetes Research Foundation) was making a documentary of my life with diabetes so they decided to come to this race to interview and tape us. So we got to the race course at 6am to help set up with the C3 guys and finished around 8:30. Just in time to watch some of our teammates in the Cat 4 race and then the Masters B race. Jimmy Klose really showed something today as he is a junior racing in the Cat 4 and finished 6th. Right after that I was interviewed which took about 30 minutes and then Patrick Blair did his. Around 10:45 we pre rode the course and was ready to roll now. Did a few more blood sugar checks and sugar was around 145, perfect for the start of the race. Race went off on time and I had a great start position on the front line. No issues with sugars the whole race. Chris Mayhew: Granola with milk. Same thing I eat every morning, just varies how much. Coffee, black. Some single origin espresso in a press pot. A Clif bar around 10a. Tons of course pre-riding and jawing with friends. Jonathan Seibold: I started this last year. I have a two egg sandwich, coffee and some fruit for breakfast pretty early in the morning. We try to get to the race so that we can get on the course before the 9AM race and pre-ride for a solid 45 minutes or so just to figure out the course. Then register, kit up and do some starts and then to the line. I always down a GU and a bottle of water right before the start. Jesse Leifert: 4:00 to 5:00 am: Try to get crying dog to go back to bed by covering her with blankets. 6:00 to 7:00 am: wake up, walk dogs around block while picking up trash from night before, pack car while trying not to forget anything, eat, wake up wife. 7:30 ish am: Hit the road to Baltimore. I had three cups of coffee, a 16oz bottle of Gatorade, some water, a bagel, and two bananas. I think there wasn’t enough substance there. I used to eat two English muffins with honey before races when I really planned out the night before. I wish I was more prepared for races the night before. Robert Sheffield: I rode the course to see what parts were wet or slippery, etc. I then did about 30 minutes on the trainer with some harder efforts to open the legs then went to the start. Michael Yozell: Erica and I have a fairly standard routine we follow. Get to the venue 2-3 hours prior to our race start time, unpack, set up the spare bike on the trainer and then go pick up numbers. After that is the time to scout the course and assess the pit. Once that’s taken care of I’ll have a light snack and some coffee. 1 hour prior to start is on to the trainer, A couple of efforts and then to the start with 10-15 minutes to go. Jesse Leifert: Make some friends that know what they are doing. Luckily for me, Route 1 Velo and Arrow Bikes have some great knowledge resources when it comes to equipment, technique, and general know-how on cross. I attended an impromptu clinic one Sunday with Scott Cernich, Ryan Douglas, and Bill Schieken and it was great to get input from them on how to do the “cross” thing. I actually want to give two pieces of advice. Equally valuable for me was to race on the road during the road season. Carrying over fitness probably helps (I can only assume since I know it wasn’t skills that did anything for me on Sunday). Adam Driscoll: Race your race and don’t worry about everyone around. Also have FUN! Chris Mayhew: Hie thee to a ‘cross practice and pre ride the course a bunch. Jonathan Seibold: Have fun and watch the faster classes. You can learn a lot by watching the fast guys. Jay Morali: It hurts. A lot! Lindsey Hillesheim: Go hard, fall, get up, and go hard again. Afterwards have a beer with your teammates and competitors. Repeat every weekend and you’ll fall slightly less often; however it will always hurt just as much. My point is to enjoy the process–it is its own reward. Michael Yozell: Practice. Most areas have some type of group that meets to go over technique and strategy. Get to those meets. They are fun and educational. 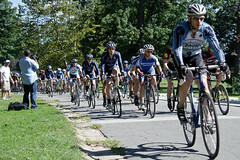 These group rides also help to grow all aspects of cycling in your area. Jonathan Seibold: DT 1450 clinchers with Panaracer Cross Blasters. 34PSI front 38 PSI rear. Adam Driscoll: Reynolds, tubulars, and tire pressure was 40. Chris Mayhew: Grifo clinchers. 32psi front and rear. Worked perfectly on that course although a front Fango might have been nice for a few of those dusty corners. Jesse Leifert: I poached my road wheels for Sundays race. Ksyrium ES clincher wheels with Kenda smallblockeight 700×35 tires. I’m not sure of the tire pressure except that when I had Scott give me his opinion (I think I was somewhere around 65 to 70 psi) he told me to let out close to half of what I had in there. They were soft enough to dent in a little with one hand without being able to touch the rim. Robert Sheffield: I used Mavic Ksyrium SL clinchers with Michelin Mud 2 tires at about 40 pounds. They worked great. Lindsey Hillesheim: Tubulars for my race set (Ksyrium SL with Challenge Grifo) and clinchers for the pit (whatever stock wheels that came with my bike and Michelin muds). Michael Yozell: I ran a set of Bontrager Aeolis 5.0 tubular with Challenge Griffo 34’s set at 27psi front and rear. I favor a slightly wider tire to enable lower pressures to be run. On a bumpy course this helps to smooth thing out. Today wasn’t that bumpy of a course but of the equipment on hand that was what I was most comfortable with. I probably could have gotten away with Challenge’s Grifo XS but hadn’t put in much time on them yet. Michael Yozell: Jeff Bahnson [First place Elite U19] asking why we went so fast. It sure would have been nice to have him up in the lead group. Jay Morali: One of my daughters jumped on the podium with me after seeing Jonathan Siebold’s son jump up there with him. It really made her day. Adam Driscoll: Well before the race they decided to mic me so they could listen to my breathing for the documentary. I was a little concerned since I only had a skinsuit and was scared I would bang it when I shouldered the bike. No issues, I just hope they didn’t hear me when chain dropped. Chris Mayhew: Pre-riding with a bunch of really good friends. It was like a group ride on the course, which was fun. I always enjoy riding with Nystrom and Fatmarc. They are way faster than me so I pick up some good lines and get a bit of inspiration. Fatmarc also pulled some high school wrestling move on me. I started reaching for his throat before he set me down. It was awesome. Jonathan Seibold: The drive up with my friends Jim (The Unholy Rouleur) and Ryan. As it always goes, we thought we knew a shortcut and ended up almost lost in the city. It all worked out though. Jesse Leifert: The first time through the sand pit was probably my most memorable because I remember seeing the guys in front of me shouldering their bikes and panicking/thinking to myself, “Jesse, you’ve never actually tried to shoulder your bicycle before!” Right before I entered the pit I was planning to try to fake a shouldering, but chickened out and did the lift the front tire using the bars while dragging the rear around technique. I used that technique for the rest of the race and then spent a good amount of time watching the masters race and 3/4 race trying to pick up the technique of shouldering a bike. Maybe next time I’ll try. Adam Driscoll: Adventures For The Cure is a non profit organization and cycling team that exists to raise awareness for diabetes, to show adults and children diagnosed with diabetes and their families how leading a healthy and active lifestyle can move you beyond your perceived limits, and to raise funds for diabetes research. Our website: www.adventuresforthecure.com. Jonathan Seibold: Thanks to my wife, Sarah, and kids, Dexter and Willow, for coming out and yelling for me. And putting up with this crazy fun we all like to have on the weekends in the fall. Jesse Leifert: The impact of the spectators and the race community at cross races is incredible. I see now why people fall in love with the sport when they first try it. The organizers put on a great race at a great venue. 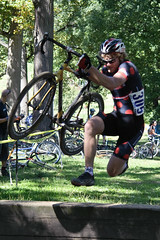 I’m really looking forward to going back to Charm City cross next year and am looking forward to all the upcoming races. Lindsey Hillesheim: First, a HUGE thank you to MAC promoters for giving the women’s 3/4 (and the 45+ women) their own race slot this year and not continuing to make us go off with the Cat 4 men as in the past. It is absolutely the right decision to make for growing and maintaining women’s participation in the sport. Second, thank you to C3 for putting on a well-organized, well-run and all-around fun event. They did a fantastic job with record field sizes. Michael Yozell: Thanks to Chris Nystrom and Chris Auer and all the folks at C3 for putting on a great event. Chris Mayhew: Great course, good time. C3 has it down cold behind the scenes. It’s by far one of the most professional setups I work with as an announcer all year. And, if you notice, almost everyone working the race at some point races that day too. It’s very impressive and shows a lot of team cohesion. Chris Mayhew: I think I just did. Thanks to my wife for letting be blow close to 48 hours to race for 45 mins. Thank you ! Adam Driscoll: Would like to give a shout out to Chris Nystrom, just a great guy who has helped me progress as a cross racer, and put on a great race. Also all my friends, family, teammates, and wife who were there to support me and cheer me on. One more big thanks to Eric Linder who sold me his Blue bike which I love now! Jonathan Seibold: Thanks to Chris (Sven) Nystrom. He runs weekly practices and imparts his vast knowledge to all that attend. I got some great advice before the race and was able to use it to my advantage during. My game has improved tremendously since I started attending them last year. Jesse Leifert: Two shoutouts: 1) Thank you to my lovely wife for putting up with this crazy hobby of mine and 2) the first annual Route 1 Velo Cross is October 11th at Magruder Park in Hyatsville MD. I’ve gotten the honor of riding the course and it is going to be a blast. Register up if you haven’t already. Robert Sheffield: We have some very talented veteran ‘cross racers on the team, and I’ve been lucky to have their experiences to draw on. 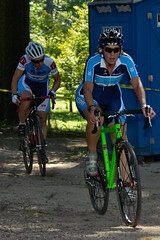 A lot of the guys and gals were around the course giving me on-the-fly pointers, which really helped me along the way. Thanks, guys! Lindsey Hillesheim: I love my Dirty Blues! Michael Yozell: Andy Taus and Dave Miller at Lion cross in Trexlertown Pa. for helping to round out a great opening weekend for the MAC. *”Druid Hill Park” in Bawlmerese.